More specifically, garlic, lemon and thyme chicken breast and a French salad vert. Let's start with the chicken. Get a small bowl, put the chicken in it. Juice the lemon and grate some of the rind over the chicken. Crush a clove of garlic with a knife, and chop it a little and toss it over the lemon-y chicken. Pull some sprigs of fresh thyme and add to the mix. Sprinkle with salt and pepper. Mix it all together with your hands. If you are preparing this with loads of time to spare, cover with plastic wrap, and let it all marinate in the fridge. If not, get a frying pan ready, heating the olive oil on medium. Toss the entire bowl into the pan (the chicken and all the juicy goodness). Let it all cook until it's no longer pink in the middle. In the meantime, wash, dry and rip up the lettuce. Place it in a bowl. With the side of the knife (in the same way as the garlic) crush the hazelnuts. Toss them into the bowl with the lettuce. In a small bowl, put a teaspoon of Dijon mustard, squirt the rest of the lemon juice (from the half lemon used for the chicken) and sprinkle salt and pepper. Start to whisk that mixture, and pour olive oil in a steady stream over it. Once the mixture is thick and creamy stop. 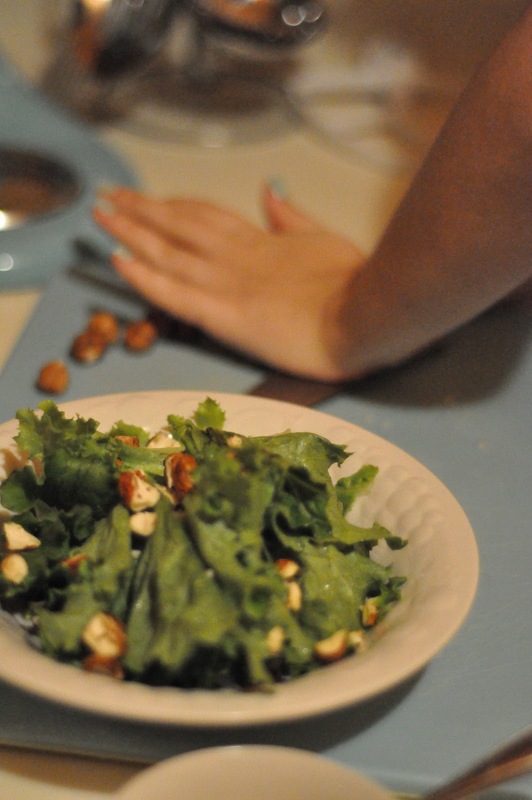 Pour over the lettuce and hazelnuts and mix together. i am going to try this !